Evocative of a sweet nosegay freshly picked from the garden, this striking, modern variation of a Grandmother's Flower Garden pattern is a tribute to Denyse' own grandmother, an intuitive and passionate gardener. 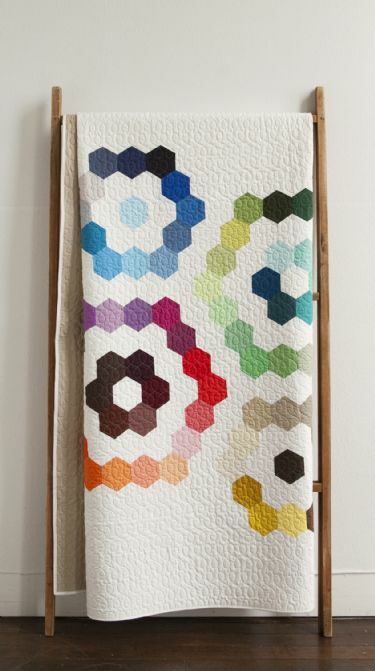 Create Mae's Bouquet quilt as shown with Denyse’s Modern Solid Pre-cut Hexagon Bundle from FreeSpirit Fabric. The bundle will make up to a king size quilt. Need a visual color reference for the Modern Solids? Download this! DSQ patterns include instructions and measurements for making the quilts in baby to king sizes. The hexagons measure 4-3/4-inches diagonally from point to point, while the sides measured going around circumference are 2-1/2".